It's time to explore new experiences. We all know and love the some of the most popular hawker centres - Maxwell, Old Airport Road, Tiong Bahru Market, Chinatown Complex and Chomp Chomp. Do you keep going to the same places? Or maybe we rarely go beyond the familiar nearby eateries. Well, it's not surprising given our long working days and punishing schedules. But we have 107 hawker centres in total, and the government has pledged to build 20 more. How many of the existing ones have you visited? The sights, smells and sounds of a new place is what can jolt our senses back to life; it may be as refreshing as an ice-cold Coke® on a hot day. There's good reason to visit and soon - not just for good food, but because this hawker centre will soon be closed in 2017 for a major overhaul. Stall owners mention the upcoming MRT developments too affecting the hawker centre. 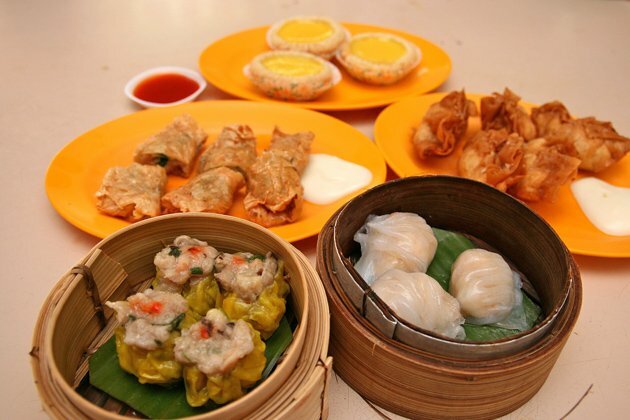 We love dim sum, even more so if it's cheap and good. Netune offers 24 items, and the baskets roll out fast and furious. Bestsellers include crispy shrimp rolls in beancurd skin (S$3) and lobster puffs (S$3.80 for five fried dumplings). The staples like har gau (S$2.80) and siew mai (S$2.80 for four pieces) are pretty decent too. Mini egg tarts are of the flaky crust variety. This stall has been here for as long as I remember, and I can see why. 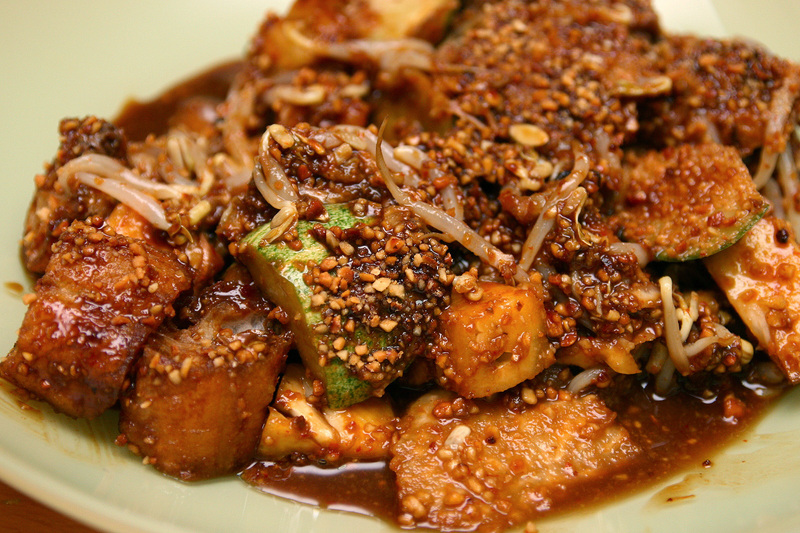 The rojak is a superb burst of flavours a Western salad would be hard-pressed to match. The crispy youtiao, aromatic peanuts, crunchy vegetables (turnips, beansprouts and cucumbers), cubes of sweet pineapple, all dressed in that spicy and pungent shrimp paste dressing - it's awesome sauce. This bowl of beef noodles is unlike the run-of-the-mill types in food courts and chain stores. It's got more spice complexity and sweetness. The S$4.50 bowl comes with generous amounts of meat. Crunchy peanuts and pickles add texture and taste. Make sure you add a dollop of cincalok (preserved shrimp) in your chili dip. I like to complete the meal with a nice Coke® zero! Dining out at hawker centres usually means no air-conditioning; so a refreshing can of ice-cold Coke is a great way to cool down. 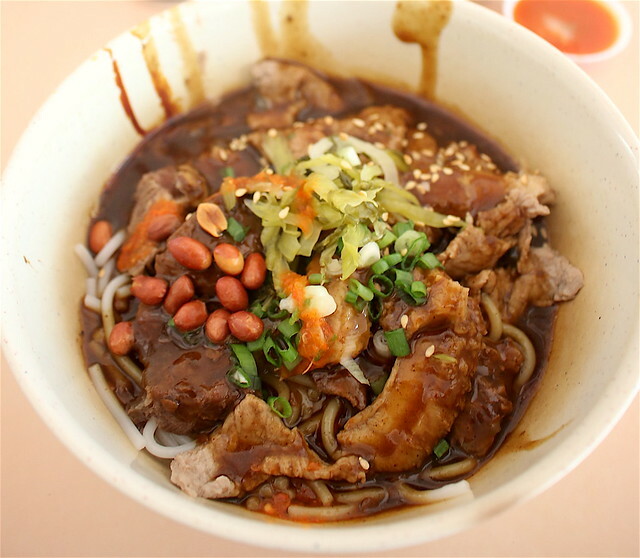 Shunfu Market was the last hawker centre built in 1985, but it's home to old school favourites like Mei Zhen Hakka Delicacies, and even modern startups like Chocolat n Spice. Bonus: Dapur Asiah satisfies your cravings for mee rebus, mee soto, lontong, mee siam, gado gado for just S$2! 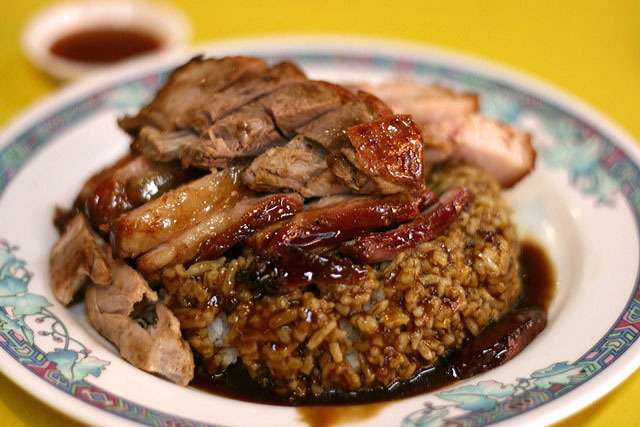 If you love roasted meats like char siew, roast pork and roast duck, try Fu Shi. The lusciously browned char siew is well-seasoned and almost melt-in-your-mouth soft from the fatty bits. The roast pork has evenly crisp crackling skin. All gloriously drenched in gravy. This is probably one of the most popular stalls in this hawker centre. Four generations have been in charge of the wok here, churning out char kway teow that keeps the crowds coming - slightly on the wet and sweetish side, thanks to abundant sweet soy sauce. The only downside is they use vegetable oil, so it's missing the pork lard magic. After all this, you definitely need a glass of Coke for the perfect pairing! What’s great food without a great drink, right? Fondly known as Bedok Corner (it is located around the bend of Bedok Road), this hawker centre carries a cosy Malay village theme. Lots of good Muslim food here! You'll be spoilt for choice for satay and Malay food at Bedok Corner. We've tried and liked Satay Solo. 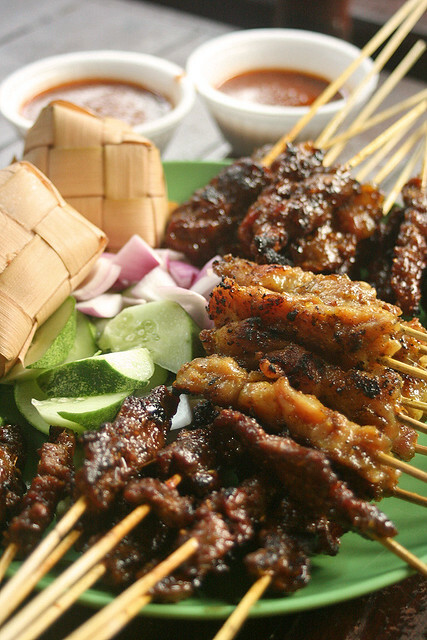 The satay is well-marinated and nicely caramelised. They also have nasi ayam penyet, nasi lemak, nasi rawon, nasi sambal goreng, mee goreng, mee soto, mee siam, tauhu goreng and lontong. Mamu focuses on just three dishes but does them well. Foremost of these is the Mee Kuah Upeh (S$8) or Gravy Noodles in Opeh Leaf. The opeh leaf is artfully folded into a boat shape container for the yellow noodles. 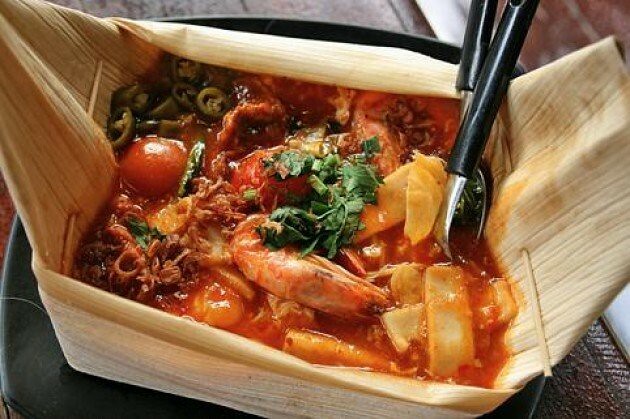 It's a tomato-based seafood-mutton gravy almost tastes like chili crab gravy and is loaded with seafood. They also do a nice rendition of Kachang Phool. They have been in business since 1939, occupying two stalls, one selling dried cuttlefish kangkong and one selling cheng tng, a Chinese dessert. 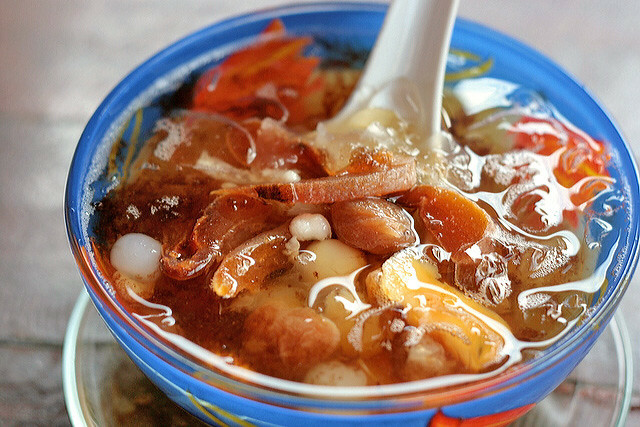 Don't miss the cheng tng here, prepared laboriously using more than 10 ingredients including dried persimmon, dried longan, barley, mung beans, sweet potato, ginkgo nuts and candied winter melon. So where will you go and what will you try in 2016? You don't have to travel far to try something new. Don't let routine cage you into same old experiences. When the daily grind gets you down, take charge and do something good for yourself. Or take a shortcut - a fizzy gulp of Coke. Perks me up every time. There are gems everywhere amongst the 15,000 food stalls, and I love finding out lesser known ones, so please share with me the ones you love.